Raising Money Could Be SO FUN!! Please request a form to fill out. * You set the price. * Consider charging $35 to make $1000 a party! BONUS $100 savings when you have 50 painters! I can now paint with over 50 people!! Add a Raffle or Silent Auction to your event to boost profits even more! The most successfully attended fundraisers charge $30 or $35. A $60 non-refundable down-payment is due to reserve your date. A travel fee of at least $30 may apply if you are located more than 50 miles from zip code 17021. * Host may not charge over $40 a person unless a meal or special venue is included. * Painting Parties by Judy will provide step-by-step artistic instruction for no more than 70 guests. No artistic skills are required of your guests. * You get to choose the picture we paint. Guests will each receive an 11x14 canvas that they will paint and take home that day. * Parties are currently held on Tuesdays or Saturdays. * 45 minutes is needed to set up. 30 minutes to clean up. * Postcard invitations made by Painting Parties by Judy may be used upon request. * One week before your fundraiser, contact Painting Parties by Judy with a final guest list. 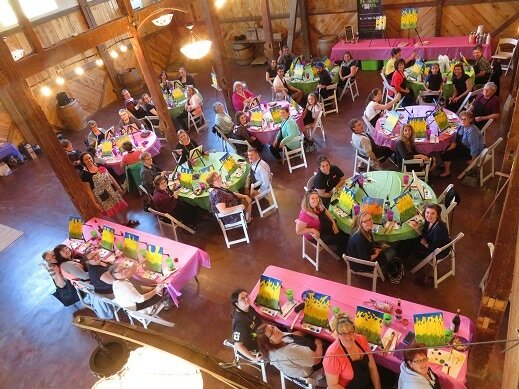 "MCS Relay for Life" team fundraiser event at Brookmere Winery. __ Pay Painting Parties by Judy by the close of your fundraiser. NOTE: A non-refundable downpayment is required to reserve your date. Painting Parties By Judy Will Provide: Table Coverings, Paint Brushes, Paint, Palettes, Easels, Wrapped Canvases, Paper Towels, Water Containers, and more. Painting Parties By Judy reserves the right to cancel parties for unforeseen circumstances. Notification will be given prior to the party and will be refunded. 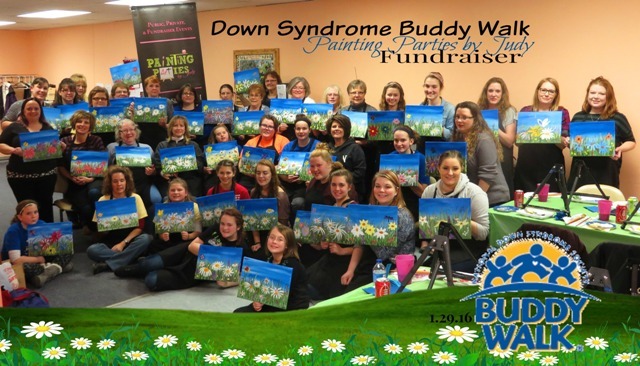 More Details Are Available in Your "Fundraiser Painting Parties Form"